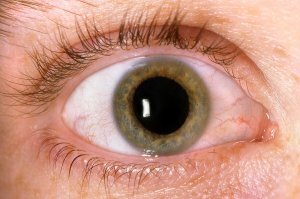 What Causes Glaucoma to Develop? Glaucoma causes a buildup of pressure inside of the eye that can result in worsening damage to the eye’s optic nerve over time. Because many people don’t experience any symptoms of glaucoma, it’s crucial to visit your eye doctor or ophthalmologist in Chicago regularly for eye exams and eye care to spot this condition as early as possible. If you have a family history of glaucoma and are over 40 years old, you should visit your eye doctor at least once a year for a glaucoma screening. Watch this video for some valuable information about what causes glaucoma to develop. Glaucoma typically develops due to genetics and age. If you suffer from diabetes, it’s crucial that you visit your eye doctor in Chicago regularly for eye exams and eye care. Diabetes increases your risk of developing dangerous and permanent eye complications, and diabetes complications can even result in blindness. Here is a look at some common eye complications of diabetes. Once you have been diagnosed with diabetes, your risk of developing glaucoma increases by 40%. 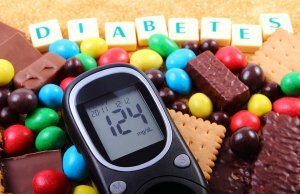 Your risk continues to increase with age, and depending upon how long you have had diabetes. Glaucoma is caused by a build up of pressure in the eyes, which causes the fluid in the eye to drain slowly and build up in the anterior chamber. This pressure can irritate or damage the blood vessels in the eye. Over time, the blood vessels become less effective at carrying blood to the retina and optic nerve, and this blood vessel damage may lead to vision loss. Your ophthalmologist may recommend medication or eye surgery to treat glaucoma. People with diabetes are 60% more likely to develop cataracts than people who don’t have diabetes. If you have diabetes, you are also more likely to develop cataracts at a much younger age, and the condition may progress faster. Cataracts cause the lens of the eye to become clouded, resulting in poor vision, light sensitivity, and progressive vision problems. Your eye doctor may first recommend conservative cataract treatment via eyeglasses or contact lenses. If your cataracts are severe or aren’t remedied by vision correction, your eye doctor will refer you to a cataract surgeon for cataract surgery. Diabetic retinopathy is one of the most serious eye complications resulting from diabetes. The condition includes two different forms of eye problems: nonproliferative and proliferative retinopathy. Nonproliferative retinopathy causes the capillaries in the back of the eye to swell, and the blood vessels become blocked as a result. Proliferative retinopathy occurs when an eye doctor doesn’t treat nonproliferative retinopathy and the condition progresses. Proliferative retinopathy causes progressively worse damage to the blood vessels, eventually leading to retinal detachment or blindness. Due to dry, cold winter air and the use of indoor heating, people are much more likely to seek dry eye treatment in Chicago during the winter. Dry eye symptoms can be uncomfortable, and can prevent you from participating in activities that you enjoy. Here are a few ways that you can protect your eyes in the winter and reduce your need for dry eye treatment. The hot, dry air from heating vents or space heaters can severely irritate your eyes, particularly if you wear contact lenses. To avoid suffering from dry eyes, try not to sit directly in front of a space heater or the heating vents in your home. You can also redirect the heating vents in your car so that they aren’t blowing directly on your face. If you do wear contact lenses, you may want to switch to eyeglasses when you’re at home with the heater on. Cold air can also make your eyes irritated and dry, and cold wind can further exacerbate dry eye symptoms. If you’re going to be outside for a long period of time, wear sunglasses or eyeglasses to protect your eyes from the cold air and wind. 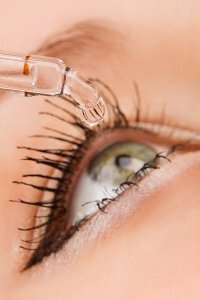 Eye drops are an effective and affordable dry eye treatment that can restore moisture to your eyes, and significantly reduce redness, itching, and irritation that may be caused by cold air and wind. If you run a heater regularly in your home, it will reduce the moisture of your indoor air. This can make your eyes irritated, itchy, and dry. To restore moisture to your indoor air, you can buy a humidifier. Humidifiers release water vapor or steam into the air to make it more humid. You can also install a central humidifier in your home’s heating unit to humidify your entire house and combat dry air and dry, itchy eyes. Diabetic retinopathy is one of the many health complications that can arise amongst people who suffer from diabetes. If you are diabetic, you should visit your eye doctor regularly for eye care in Chicago to reduce your risk of developing diabetic retinopathy. There are two types of diabetic retinopathy: non-proliferative diabetic retinopathy, and proliferative diabetic retinopathy. Non-proliferative diabetic retinopathy refers to the early stages of diabetic retinopathy. In its earliest stages, patients will experience few, if any, symptoms. Non-proliferative diabetic retinopathy occurs when the blood vessels in the retina become damaged as a result of prolonged increases in a person’s blood sugar levels. Increased blood sugar causes the blood vessels to weaken and develop small bulges on their walls. These bulges are called microaneurisms, which can leak fluid into the retina and cause macular swelling. If you do not seek treatment from an eye doctor at an optical center during the early stages of diabetic retinopathy, the condition will progress to proliferative diabetic retinopathy. In this stage, the retina becomes deprived of oxygen, and may develop scar tissue or detach. Without treatment from an ophthalmologist, proliferative diabetic retinopathy can cause blurry vision and complete vision loss. If you’re tired of wearing eyeglasses or contact lenses and are considering another form of vision correction, you may be wondering if you should visit an ophthalmologist for LASIK surgery in Chicago . LASIK is an incredibly safe and effective method of eye surgery, and has high success rates for vision correction. An ophthalmologist at an optical center near you can provide a LASIK consultation to determine if you are a good candidate for LASIK eye surgery. Watch this video for some helpful information about how LASIK vision correction is performed. Dr. Alan Wagner, an experienced ophthalmologist, discusses some of the ways that you can tell if LASIK surgery is the right form of vision correction for you. If you suffer from diabetes, you’re at an increased risk of developing a number of serious health complications, including eye problems like diabetic eye disease. For this reason, it’s crucial that you visit your ophthalmologist in Chicago regularly for eye exams and comprehensive eye care. Here are some important facts about diabetic eye disease that you should discuss with your eye doctor. Diabetic eye disease is a group of eye conditions that eye doctors commonly diagnose in people who have diabetes. These eye conditions include diabetic retinopathy, diabetic macular edema, cataracts, and glaucoma. 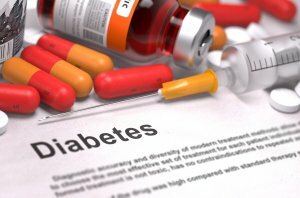 These conditions are either caused by diabetes or diabetes complications. 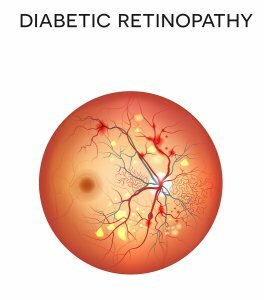 When someone with diabetes has chronically high blood sugar, the blood vessels in the retina may become damaged, resulting in diabetic retinopathy. If untreated by an ophthalmologist, this condition may progress to diabetic macular edema, which causes a build up of fluid in the retina that eventually results in blindness. In its early stages, diabetic retinopathy does not cause any significant symptoms. The longer that the condition progresses without intervention by an eye doctor, however, the more severe the symptoms will become. The retinal blood vessels can begin to bleed and cause an increase in floaters in the eye. If the condition progresses and diabetic macular edema develops, you will experience blurred vision, other changes in vision that resist attempts at vision correction, and eventually, complete vision loss. Once diabetic retinopathy progresses to diabetic macular edema, your eye doctor has a few different eye care treatment options. Depending upon your symptoms, your ophthalmologist may recommend laser eye surgery, or medication. Laser eye surgery corrects damaged and leaking blood vessels in the retina using laser heat. Your eye doctor may also try to correct macular edema via corticosteroid injections, or anti-vascular endothelial growth factor. These injections can be used in addition to, or instead of, laser eye surgery. People with diabetes must visit their ophthalmologist or eye doctor in Chicago regularly for eye care. Diabetes increases your risk of developing certain eye conditions, including diabetic eye disease, vision loss, and blindness. To lower this risk, and your need for future vision correction, you should take the time to learn more about these eye conditions, start by reading these answers to common questions about diabetic eye disease. What Eye Conditions Are Grouped Among Diabetic Eye Diseases? Diabetic eye disease encompasses a group of eye conditions for which someone with diabetes may be at increased risk. 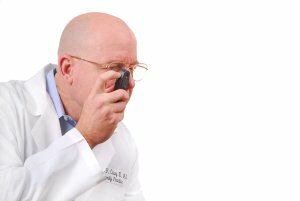 These conditions include glaucoma, cataracts, and diabetic retinopathy. Glaucoma results from an increase of the fluid pressure within the eye, which eventually causes optic nerve damage and vision loss. Cataracts are caused by a clouding of the eye’s lens, leading to vision problems that require eye correction. The most common is diabetic retinopathy, which is caused by damage to the retinal blood vessels. Glaucoma causes few initial symptoms, and most patients don’t realize that they have the condition until they suffer from peripheral vision loss. The condition can also cause headaches, blurred vision, eye pain, eye redness, nausea, tunnel vision, and seeing halos around lights. Cataract symptoms include vision that is cloudy, dimmed, or blurry, seeing halos around lights, light sensitivity, poor night vision, distortion of color perception, and a need for progressively increased vision correction. Symptoms of diabetic retinopathy occur later in the disease’s progression, and include floaters, blurry vision, impaired color vision, an intermittent need for vision correction, and vision loss. You can’t prevent diabetic eye disease, but you can significantly lower your risk of developing an eye condition, or of suffering from vision loss if an eye condition develops. If you suffer from diabetes, you must visit your ophthalmologist for eye care once a year, including a comprehensive, dilated eye exam. If your eye doctor detects symptoms of an eye condition early enough, your treatment and vision correction will be much more effective. What are the Differences Between Floaters and Flashers? Floaters and flashers impair vision, and may be symptomatic of a more serious eye condition. If you experience persistent or progressively worsening floaters or flashers, you should visit an eye doctor or ophthalmologist in Chicago for eye care as soon as possible. Both floaters and flashers result from changes to the vitreous fluid caused by aging. Floaters appear as small, moving specks that interfere with your vision. They are caused by the movement of small cells or clumps of material in the vitreous fluid that cast shadows on the retina. Flashers appear as sudden and swift flashes or streaks of light, which may occur intermittently and persistently for several weeks. As you age, the vitreous fluid shrinks, forming clumps or strands. If it detaches from the wall of the eye, known as posterior vitreous attachment, you’ll experience floaters and flashers. If you’ve sustained an eye injury, are over 45, or have severe nearsightedness, you should visit an eye doctor or ophthalmologist immediately after a sudden increase in floaters or flashers, loss of peripheral vision, or a sudden need for vision correction. These may be symptoms of retinal detachment, which may cause blindness. Cataracts are a relatively common condition, and become even more common with age. Almost 25% of people between the ages of 64 and 69 have cataracts, and the percentage rises with age. Cataracts occur when the lens inside the eye becomes clouded, affecting your ability to see. As cataracts get worse, your vision will grow increasingly impaired. Instead of living with vision loss, consider cataract treatment near Chicago so you can see as well as—if not better than—you did before. Advances in intraocular lens technology allow your eye surgeon to implant lenses that correct cataracts as well as vision issues such as nearsightedness and astigmatism. Take a look at this infographic to learn more about cataract surgery and how it can benefit you. Please share with your friends and family!